We're all aware that this issue of perception defines most of what happens in our lives. Both in love or in politics, we define our own roles according to perceptions such as that of the glass being half empty or half full. So it is not surprising that the concept of representing perceptions is at the heart of photography today. However, this notion is not only related to photography. I read today a paragraph in a financial newsletter that stated: "The friction between perception and reality is where profitability is found". If we take this idea a few steps further, we can see that this is also true in a lot of different areas of our lives such as literature. Who could disagree with the premise that the friction between characters in a novel, precisely between reality and perceptions, is where "profitability" -as in, making a better story- is obtained. Photography in that sense, in it's intimate connection to literature, also gains considerably when we are capable of taking advantage of that friction between a perceived reality and reality itself. One can hardly deny the visual sore that is depicted in the picture above. 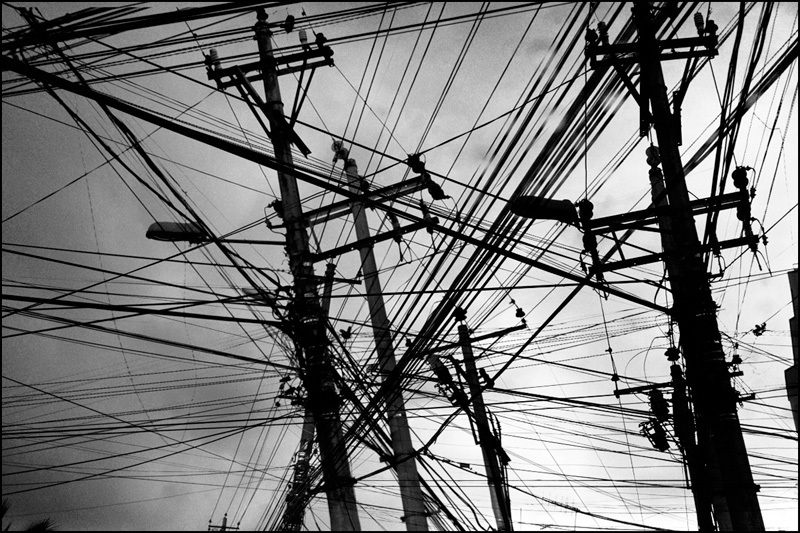 Every city in the world where "modernity" has arrived can provide us with such an example, where electricity and communications of every type, intersect our skies. Yet at the same time, we are also confronted with a certain elegance of these lines. Consigning all these cables to a photograph serves to describe the precise moment when civilization lost it's senses and no one was there to look out for our visual well being. The glass half full however, would be that through all these collective eye sores, we are able to construct and share such thoughts and pictures. The cycle of friction between reality and perception, has taken it's full course. Interesante perspectiva, percepción la de Pedro sin duda, la fusión que hoy día coexiste en todos los territorios, quizá nos aproxima de alguna forma a esa "fricción entre percepción y realidad", en continuo. Lo importante es no dejar de lado la "fricción" entre realidades y percepciones, entre seres humanos. life is a mess of possibilities. Perception defines our lives? and the sky is blue? de Selby couldn't have said it any better. I'm glad we have all gotten past this digital/film conversation. The truth lies in the perception. I, personally, love this photogrph. It fills me with hope. I see electricity powering lights and air conditioners and computers (and darkrooms). And phonelines connecting this and that. We also see a mess, a disaster. Such is the world we live in. Has it ever been any different? This is the place to consider these things. |2010-08-29 19:26:52 Augusto Mandujano - Entre las aberraciones. Lamentablemente vivimos en el mundo donde las desiciones las toman quienes más poseen para poseer más. sin embargo, no pueden adueñarse de nuestra percepción y aun cuando existan aberraciones visuales, los fotógrafos somos responsables de transformarlas en imágenes estéticas cuando ls trasladamos a la pelicula o al papel. Exito con la serie María. Esa fricción puede incluso proveer de matices a la existencia misma. Lo interesante aquí es obtener de ello una experiencia que nos haga socialmente mejores seres humanos y más responsables con nuestro entorno, como bien lo señaló Pedro. Vivo en una región traspasada por torres de alta tensión. Por kilómetros estos cables viajan arruinando paisajes costeros, barrancas del río Salado, Laguna Setúbal y Paraná En mi ciudad existe una playa en la cual una torre se encuentra en el área de solarium! Lejos de denunciarla a esta realidad la hemos tomado como propia. Tengo en mente realizar una serie de fotos donde se ilustre semejante aberración.